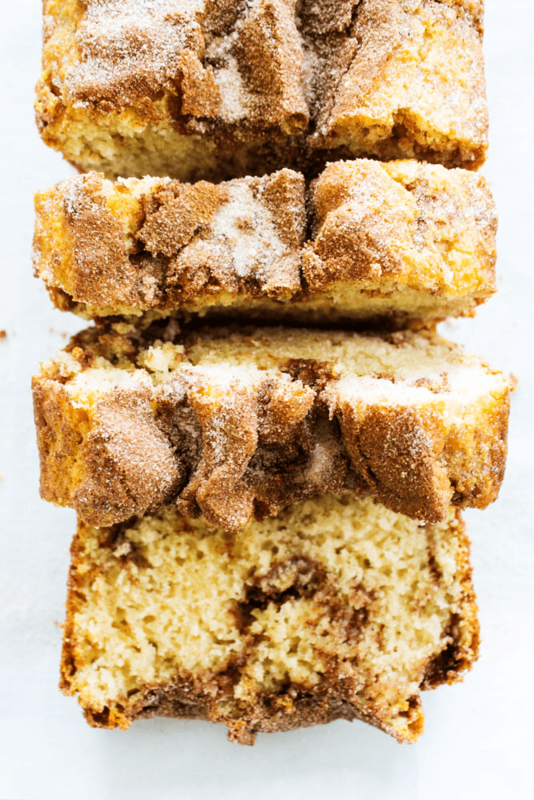 CINNAMON SUGAR BREAD is like eating a cinnamon & sugar cake donut but better. Easy & delicious this bread is ready to devour in an hour. 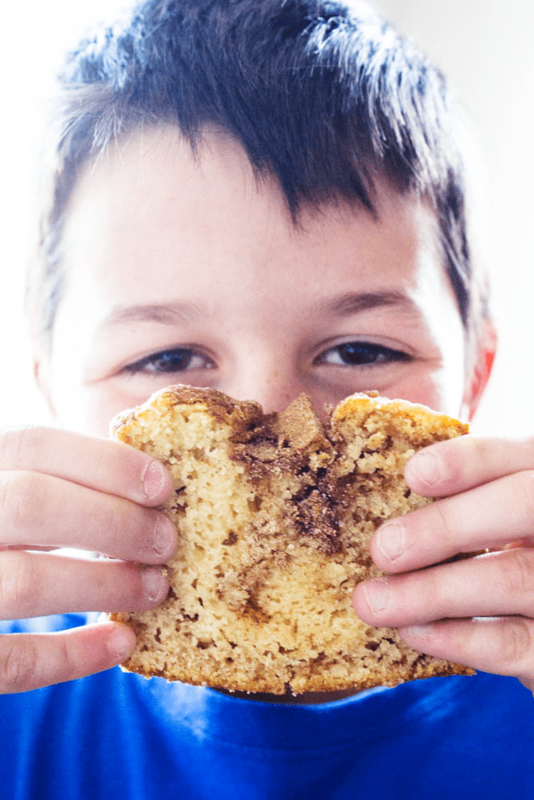 This Cinnamon Sugar Bread is simple, sweet, and super easy! It’s perfect for a cold wintery morning with breakfast. I love giving this as a gift to friends and family during the holiday season. Simple and delicious, what’s not to love? Alright friends, I am so excited with how this recipe for Cinnamon Sugar Bread turned out. It tastes exactly what exactly what I was hoping for. 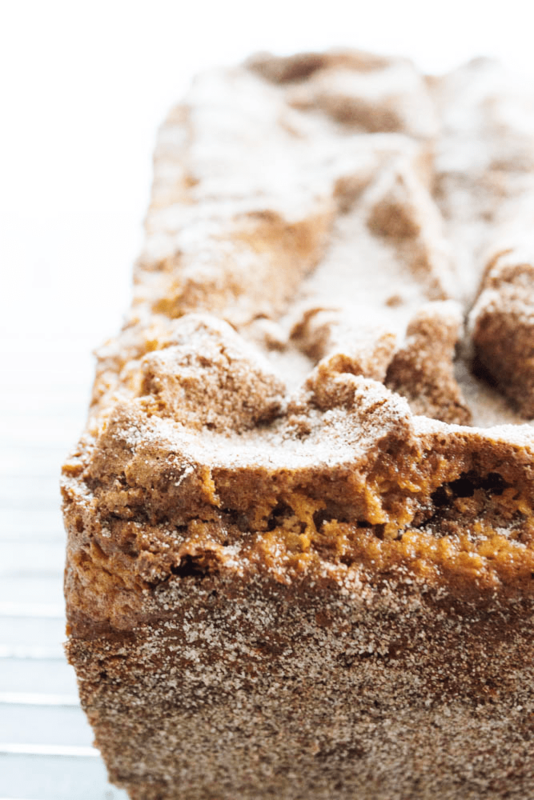 And I just want to say thank you so much to Costco for inspiring this Cinnamon Sugar Bread. I always eat their samples there and while tempted to put the 3-pack of this deliciousness I really don’t need 3 loaves of this bread around as I will be tempted to eat it all. And like, I have no self control. So our weekends are pretty hectic around our house, with all of the kids activities and really the only 2 things that are a guaranteed for every weekend are date night with the hubs and a Costco run. Now while you would think that I would make this grocery run on my own, nope the hubby is always down for going and not because he wants to spend more quality time with me, it’s all about the samples. He loves the samples from the cheese ot the meats, oh and the bread. He loves hitting up the stations like he is meeting some celebrity. I try to disown him at this time, as I get completely embarrassed when he hits up the cheese stations about 13 times in a row to where the sweet old ladies are usually giving him the furrowed eyebrow. The holiday season is the worst, I typically will have my shopping done and am in the checkout line when he is hitting up the cheese or meat station one last time. I love the samples too but I lean towards carbs. I am all about the bread. This Cinnamon Sugar bread is one of my favorite things to grab while shopping and this past weekend I was in luck and they had it out for sample. The kids and I grabbed our samples and I asked the hubs to still grab one for himself, so that I could eat it. He did. You see I am not one to go back multiple times, I will just buy it if I like it. While I wanted to buy the loaf of Cinnamon Sugar Bread it came with 3 loaves and right now the fact that we are reducing the amount of sugar and carbs (sugar) in our diets, having 3 loaves around would not be good. Sunday morning I always make a nice breakfast, usually crepes but those are very time consuming. This Sunday we had to head out of town for a family party and so I needed something I could just whip up and bake. I decided to go with a loaf, a single loaf of Cinnamon Sugar Bread. Then the hubs made up some scrambled eggs. It was a perfect pairing for a morning we didn’t have much time. I love easy recipes, that are just as delicious and that are inspired by some of our favorite eats. 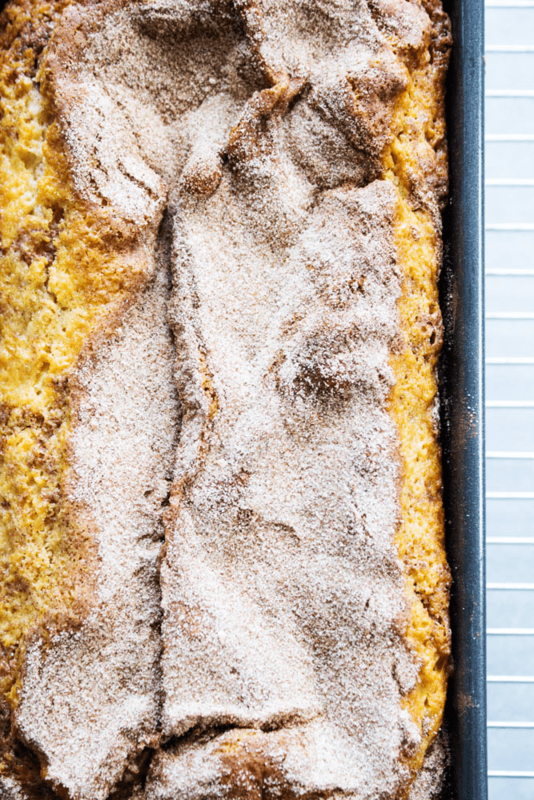 This Cinnamon Sugar Bread is something that you can whip up in 10-minutes and then let the oven do the rest of the work. 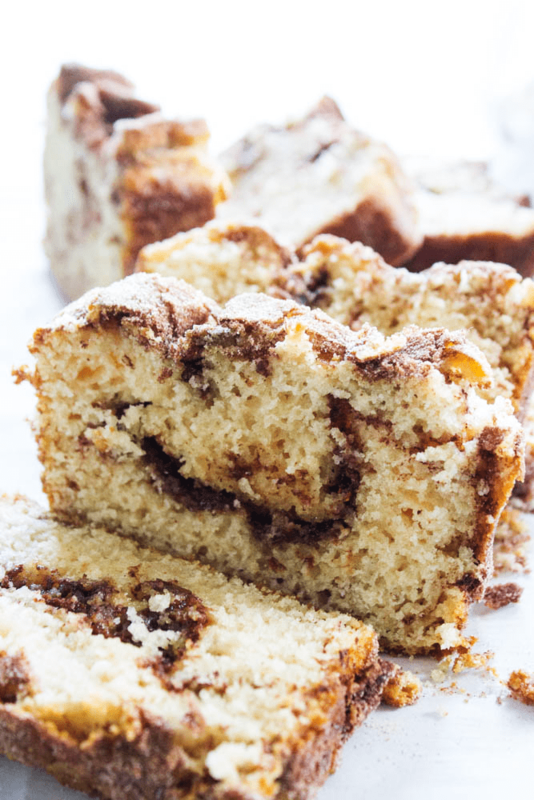 How do you make easy cinnamon bread? In a medium mixing bowl combine flour, baking powder, salt, remaining 1 teaspoon cinnamon and remaining 1 cup sugar. Remove loaf from pan onto a large plate. The loose cinnamon and sugar will come off onto the plate. Carefully press all the sides of the bread onto the cinnamon and sugar that comes off onto the plate. What do you eat with Cinnamon Sugar Bread? You can eat it with pretty much anything! It’s great for breakfast with fruit, or dessert with a little bit of ice cream! A personal favorite is with a little butter or cream cheese with breakfast! 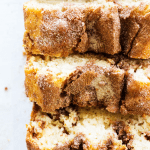 My favorite kitchen items I used to make this CINNAMON SUGAR BREAD. 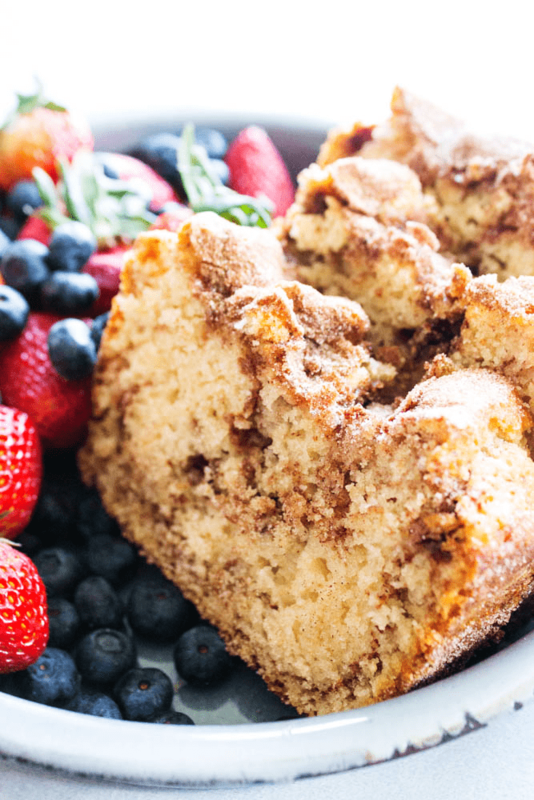 Don’t forget to pin this CINNAMON SUGAR BREAD recipe to your favorite Pinterest board for later. In a medium mixing bowl combine flour, baking powder, salt, remaining 1 teaspoon cinnamon and remaining 1 cup sugar. Sift together to combine. I know this is a dessert, but I am certain I’d be eating this for breakfast with my morning coffee. When my kids were small they loved cinnamon toast. This is like the better, more grown up version of that! Can’t wait to try this recipe!! I think I have fallen in love with this recipe! I am all about the carbs too and add this bread to my newest obsession! Yum!! OMG! This is my kind of bread! Looks delicious! perfect for my breakfast! Oh yum, I could go for a big slice of that right now! We were working on my son’s campaign finance report this morning, which was due by 5 pm and I was thinking donuts but remembered I had left this recipe open on my kindle so, of course, why not make this and skip the drive to the bakery? Everyone loved it!! Bonus, it was so easy and in less than an hour we had fresh, hot, delicious cinnamon bread! Thanks for sharing!! I’ll be pinning this for future use! Thanks, I’m so glad you enjoy it!